In General, Blogspot Search Summary page is the landing place where visitor searching some query within our search box with the suffix "/search?q=query". In Practice, Search Summary Result is found everywhere. Label page has URL Formatted like "/search/label/LabelName" and is same as "/search?label=LabelName". And when we type "/search" without suffix, it will show all the article that we have. Uncustomized Blogger template or the Old Blogger template, if we go to that area, basically it will show limited number of the Article in it. The problem comes if we don't have Jump Link in our article or we set article that has <!--more--> contained too much word. It will make our blog shown like an unlimited long page. The code we want to use is split in two part. The first code is to make instruction call an inclusion with <b:include/> tag, and the second is the inclusion itself. Code above is only for Layout Version 1 and 2. In Template editor, and find <b:include data='post' name='post'/> its inside Blog1 Widget main inclusion. Find this code <b:includable id='main' var='top'> its in Blog1 Widget area, and then Copy and paste the inclusion code above, right "before" it. Save template and see the change in Label page and search page. Now its time to explain the content inside the inclusion. The code between <style> and </style> its the CSS code to make how our Post Summary look like. This code is contain the Post title along with their post links. 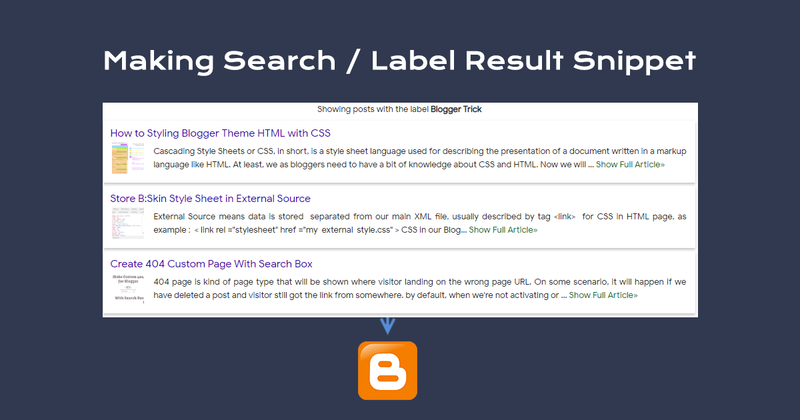 We give an expr: attribute to the HTML href attribute, so we can use Blogger data expression. With <b:if> Conditional tag, we define if the post have any image, then it will take the first image in the post as thumbnail. Also in this block we using resizeImage operator to resize the image to 72x72px. In this part, we using <b:eval> tag to evaluate the post body with help of snippet operator we give limit to only show the first 250 character of the post article body, eliminate any link and a linebreak to be displayed in the summary, then give a Link to its article in the tail of the summary.